Wireless BT 4.2 Technology ensures transmitting strong signal in high quality and high speed and offering high-fidelity stereo music. S301 with high-quality dual 3W speaker and vibrating diaphragm, delivers clean and great sound quality, the sound will fully fill the room. Build-in high capacity rechargeable 1200mAh battery, it provides 8-15 hours of working time. Powered by the included Micro USB port. 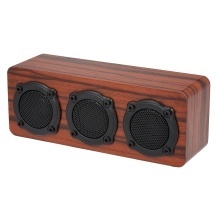 The wooden speaker is gorgeous and exquisite allowing it to look great in your home with a natural environmental protection. Suitable for almost all BT-enabled audio devices, especially best for enjoying music and movie. Four anti-slip pad ensures stability.